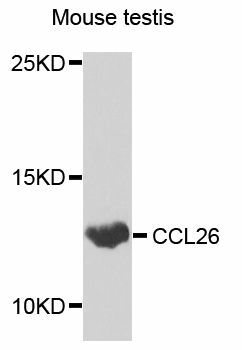 Small volumes of anti-CCL26 antibody vial(s) may occasionally become entrapped in the seal of the product vial during shipment and storage. If necessary, briefly centrifuge the vial on a tabletop centrifuge to dislodge any liquid in the container`s cap. Certain products may require to ship with dry ice and additional dry ice fee may apply. This gene is one of two Cys-Cys (CC) cytokine genes clustered on the q arm of chromosome 7. Cytokines are a family of secreted proteins involved in immunoregulatory and inflammatory processes. The CC cytokines are proteins characterized by two adjacent cysteines. The cytokine encoded by this gene displays chemotactic activity for normal peripheral blood eosinophils and basophils. The product of this gene is one of three related chemokines that specifically activate chemokine receptor CCR3. This chemokine may contribute to the eosinophil accumulation in atopic diseases. Western blot analysis of extracts of mouse testis, using CCL26 antibody at 1:1000 dilution. 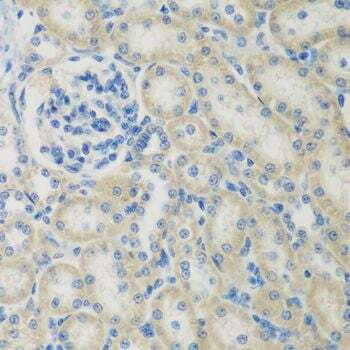 Immunohistochemistry of paraffin-embedded rat kidney using CCL26 antibody at dilution of 1:200 (40x lens). 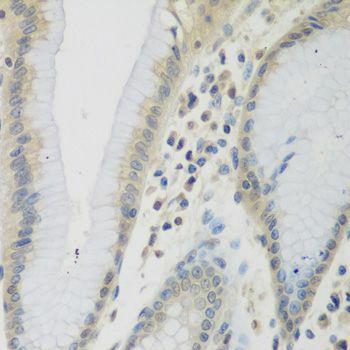 Immunohistochemistry of paraffin-embedded human stomach using CCL26 antibody at dilution of 1:200 (40x lens). 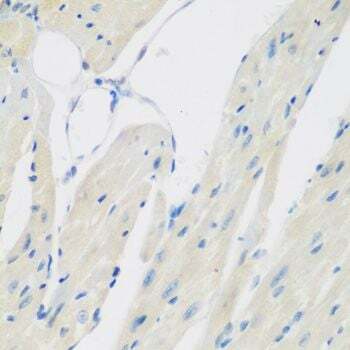 Immunohistochemistry of paraffin-embedded mouse heart using CCL26 antibody at dilution of 1:200 (40x lens). NCBI/Uniprot data below describe general gene information for CCL26. It may not necessarily be applicable to this product. CCL26: Chemotactic for eosinophils and basophils. Binds to CCR3. Belongs to the intercrine beta (chemokine CC) family.